Click to Upload Your Picture! When I opened the package and saw the finished canvas for the first time, I stood and cried. I was so excited! You did such an incredible job..
My image was blurry when the guys at Print On Canvas first enlarged it. They immediately called me to send another file. When the image was enlarged, they realized it would look better as a panoramic photo rather than a standard square. They were right! It turned out amazing..
With Print On Canvas Singapore I managed to send my grandma a gift with a true value. Thank you for the great customer support and for the prompt delivery..
Click 'Upload Photo' and your photo will begin uploading to the PrintOnCanvas system. It may take up to a minute or two to upload your photo, depending on your internet connection speed and the size of the file. Once your photo is uploaded you will see it in the editing pane, where you will be required to choose your desired size, quantities required and other options. How to print on canvas a paper/physical photo? If you want us to print on canvas a physical photo, please convert it to a digital file using a scanner at a minimum of 300dpi resolution for better results. Feel free to contact us if you need further guidance with this. The resolution achieved from most modern digital cameras will be suitable for printing on canvas however, for best results, we recommend using a camera that is at least 2 mega pixels. Our technology allows enlarging images with minimal loss of details. 1. Standard Wrap - Sometimes it is referred to as 'Non-Wrapped'. The canvas on the sides of the frame is left with a white color. This is recommended for images where the 'subject' is close to the edge of the photo. 2. 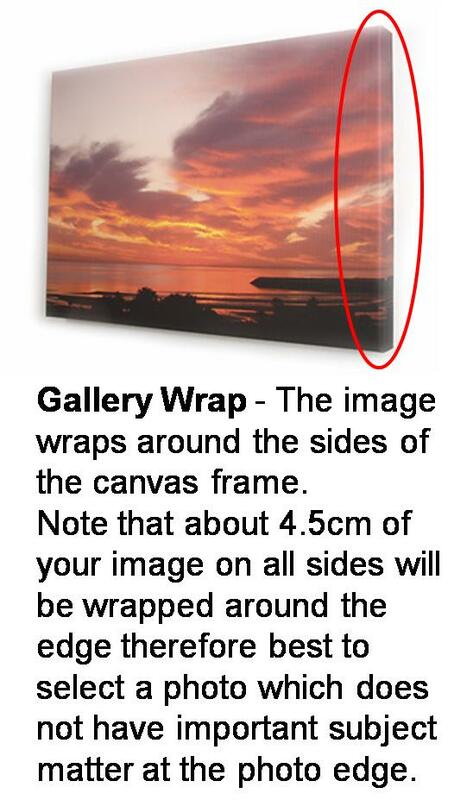 Gallery Wrap - The image wraps around the sides of the canvas frame. This is also referred to as 'Bleed Wrapping'. Approx 4.5cm of your image on all sides will be wrapped around the edge of the wooden frame, it is therefore best to select a photo which does not have important subject matters at the edge of the photo. 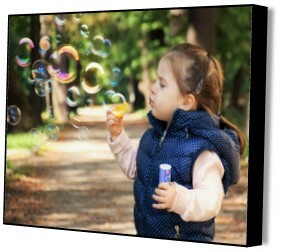 Your canvas picture will arrive ready to hang on your wall. In addition, the canvas picture can be provided unframed and delivered as a rolled canvas. If you prefer the rolled canvas, indicate this at the ordering stage. At PrintOnCanvas, all our products are packed in their very own custom-made art boxes. Each canvas is securely wrapped in layers of bubble wrap, and carefully packed to avoid any damage, whilst in transit to you or your loved ones. We believe your canvas should reach you in the same condition it left our studio. We are committed to delivering within 5 working days (not including weekends), however usually our delivery is between 5-7 working days. All canvases are customized upon order. We don't mass produce canvases. Smaller items such as non framed canvases are often sent out on the same day. If you require express service, this can be arranged at an additional cost. Contact us if you require express service and we can advise you of the costing. WE LOVE WHAT WE WE DO AND IT SHOWS IN THE FINAL RESULT, YOUR BEAUTIFUL CANVAS PRINT! Made with the Highest Quality Materials! Fast Delivery Guaranteed in Singapore! Any picture dimension is possible! Q. What is a canvas print? A. At Print On Canvas we take your uploaded photos and print them onto artist grade cotton canvas using the latest large format printers with cutting edge printing technologies. The ink penetrates into the canvas so that the texture of the canvas is still visible. We then laminate the canvas with a thin protective layer that seals in the colors and provides a professional, sharp finish. After your print is ready, the canvas is carefully wrapped around a thick wooden stretcher frame ready for hanging directly on your wall, or can be shipped as a rolled canvas without framing. Q. Can I print on a 80 cm by 80 cm square canvas? A. It depends on the photo that you would like to upload and print. After uploading your photo you can chose to customize the size of your photo by choosing small, medium or large. If you choose to customize, you need to enter the requested size. If 80X80 is good for your photo the site will let you continue with your order. If not, the site will automatically fix the height and the width of your photo. A. We charge $15 for orders within Singapore. We deliver once per week, on a Wednesday. If you wish to receive your canvas before the standard delivery day, you will be charged additional $25 for express delivery. For overseas orders we charge a fixed fee of S$120. Note, that PrintOnCanvas may change the overseas shipment price according to current postal charges at the time of order. Q. Can I buy the picture for my relatives overseas? A. Yes, we deliver worldwide. Q. What is a Gallery Wrap? A. We can provide the canvas print in two wrapping formats, with or without Gallery Wrap. A gallery wrap is when the image folds around the edges of the frame. 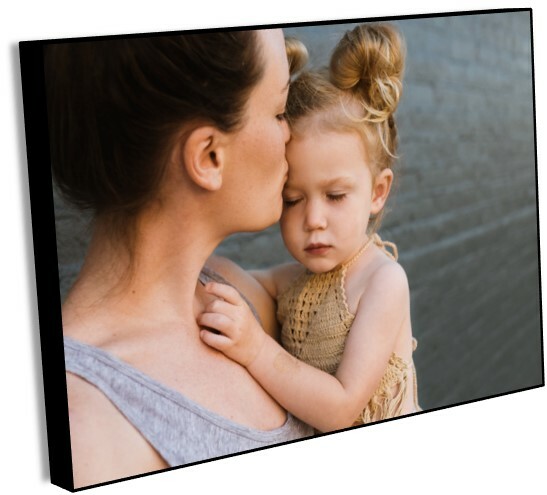 Alternatively, in Standard Wrap (no wrap) the photo is presented on the front of the canvas and will have plain white edges for a more contemporary look. Q. Can I make a canvas print from actual photo which is not a digital file? A. Yes. You need to scan your picture and send us the digital file. Q. How long will it take to get my canvas? A. Singapore - deliveries every Wednesday. Express deliveries in Singapore - 48 Hours. Overseas deliveries - within 14 working days. Q. Can I hang the canvas prints outdoors? Q. How do you recommend cleaning the canvas print? A. A damp cloth can be used to gently wipe the canvas. Q. Do you offer any kind of guarantees? Q. What payment method does Print On Canvas accept? [email protected] serves as a portal for businesses to submit their e-invoices when transacting with the Government & Statutory Boards. A. We are committed to protecting your privacy and all your personal information. Your personal details are essential for the delivery of the items you have ordered. We will only use the information that we collect about you lawfully. All personal data shall be only used for the purpose of meeting your needs, unless you specifically agreed that it shall be used for other purposes as periodic updates about our promotions. 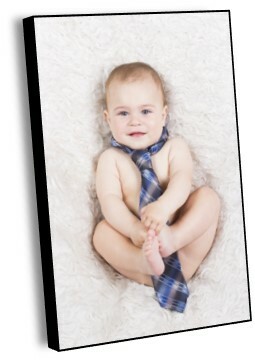 Q: Do you supply canvas prints to professional photographers or commercial customers? A. Yes. We provide canvas prints to interior designers, architects, retail outlets, offices and other commercial customers. Q. Do you offer a discount for professional photographers or large orders? A. Yes, 'Contact Us' for more details. Q. What kind of canvas you are using? A. As we are using cutting edge printing technology and the finest canvas material (330gr), we are positive that you will be satisfied with our print quality. In addition, we use fine quality wood for the canvas framing (including a metal hanger), hence you will receive a top end quality product. Q. What goes on the sides of my canvas? A. Normal pictures are two-dimensional, whereas canvases are three-dimensional. So for the edges, you can select a solid color for the edges / have the original image extended (image wrap), or have the edges mirror image of the border. If you have important features on the canvas, we suggest you take the mirror finish option so you don’t lose any of the important parts of the image in the wrap. For all other images, you can go with either of the options.